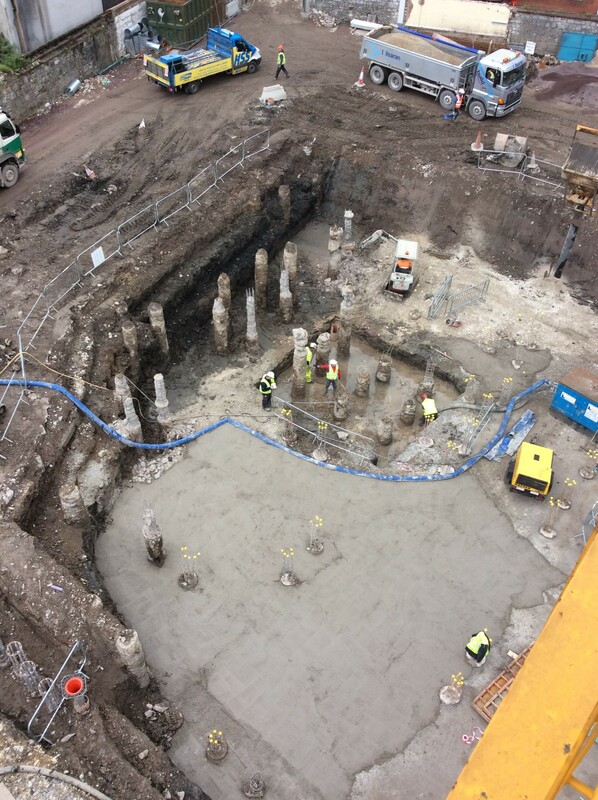 AGL Consulting designed a dewatering system for the open excavation for the single level basement of the New Court Buildings adjacent to the River Lee in Cork City. The single level basement was constructed without any cut-off walls. The New Court Buildings at Cork City were constructed by BAM off Anglesea Street; Union Quay, which is on the south channel of the River Lee, formed a tidal river boundary about 75m away from the excavation. Ground conditions at the site consisted of Made Ground overlying Silt/Peat over a tidal gravel aquifer. Formation level for the single level basement was generally within the Silt/Peat layer but lift shafts and storage tanks required local excavations into the gravel in places. 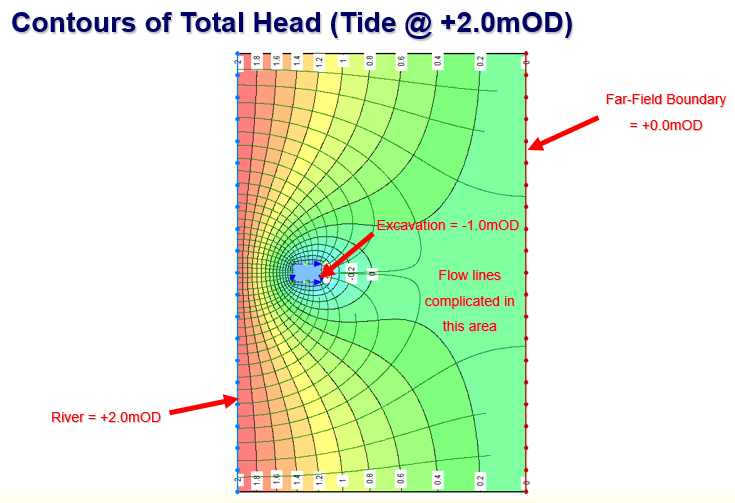 Groundwater flows into the excavation for different tide levels were determined by carrying out pseudo steady state static analysis using the Seep/W 2-D finite element seepage modelling program, with the findings checked using flow nets. 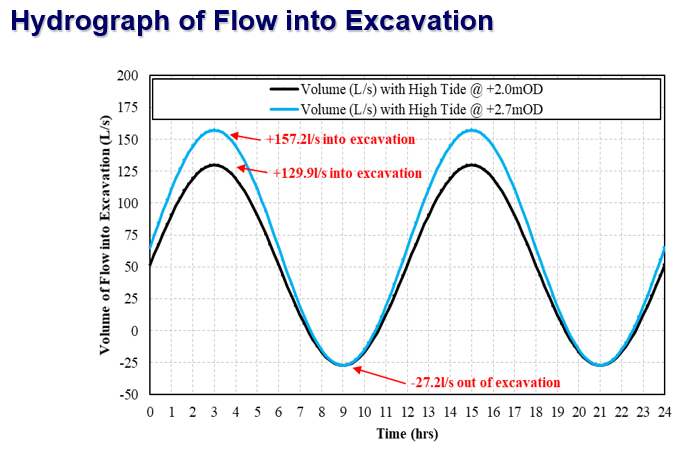 Transient elements of the tidal aquifer were considered by applying a time-varying boundary condition to simulate the tidal river level, which allowed a hydrograph to be developed showing the variation of pumping requirements with time. Allowance was made for an extreme tidal surge event where the water reaches the quay elevation, which did actually occur during the construction of the basement. The feasibility of using shallow flooding of the excavation as a means of risk mitigation for an extreme tidal surge event was considered. An array of 10 No. 300mm diameter wells was installed, each to a depth of 15m; pumps, each with a capacity of 20 l/s at its working head, were available for installation into the wells, as required. Advantage was taken of the silt layer which overlays the gravels and the lift pits excavations which extended into the gravel aquifer to minimise the pumping required from the wells. This arrangement worked satisfactorily for the standard tidal cycle and during a major flood surge event which occurred in early April 2016 when the water overtopped the quay and there was flooding of the adjacent streets. Dewatering commenced on the excavation for the basement in April 2016 and was essentially complete by the end of July of that year. At its height, when dewatering was required for the lift pits, pumping was carried out from 3 No. wells and from the lift pits, with estimates of the maximum pumping at about 100 l/s. 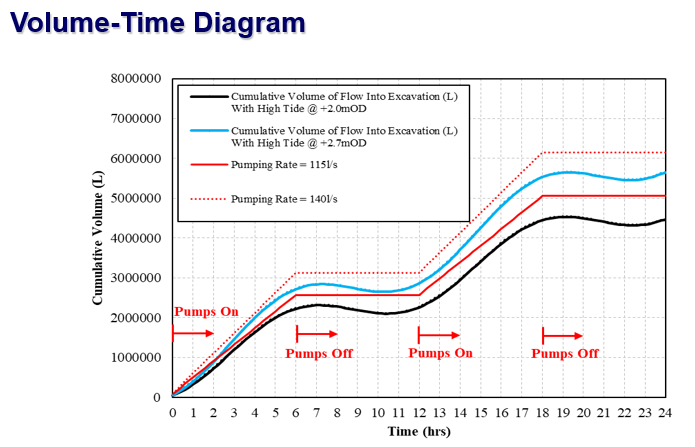 Generally, it is estimated that the pumping was less than about 80 l/s.